At some time in our lives, each of us may feel overwhelmed and may need help in dealing with our problems. Whether it is problems with a marriage or relationship, a family situation or dealing with losing a job, the death of a loved one, depression, stress, burnout or substance abuse, a trained, licensed professional can help you. A professional understands that the losses and pressures of daily living can at times be significantly draining and working through these problems becomes essential to preserving your mental health. However, looking for a good therapist can be a daunting task as therapy, in most cases, is successful because of the relationship between a client and therapist. If you feel the need to work with a therapist, it is essential to find someone that you connect with and have an excellent working relationship. 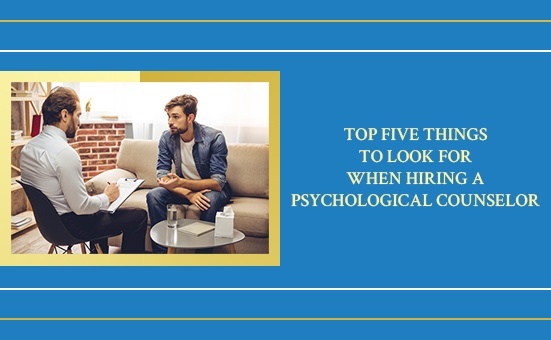 To help you narrow down your search parameters and select a professional that matches your expectations, here’s a list of the top five things to look for in a psychological counselor. 1. Select a therapist who adopts a flexible approach. Psychological counseling is not a discipline where one size fits all. Some clients need direction, while other clients simply need the therapist to follow their lead. Therefore, it is vital to find a therapist, who will quickly tune in to your needs. A therapist, who is too rigid, is unlikely to be of help to most clients. 2. Avoid a therapist who uses only one approach. In continuation of the point above, you should not select a therapist, who regardless of your problem has only one approach. Counseling is not like medicine or surgery, which are standardized treatments for all patients. In the case of psychological counseling, no approach to therapy is right for every client. Look for a therapist, who can apply various methods to clients with different problems. 3. Look for a therapist who has experience in treating your particular issue. While therapists are typically generalists, a therapist will be more experienced and comfortable with specific age groups and a certain kind of problems. For example, it wouldn’t help you much to go to a therapist with experience in employment issues when you are seeking marriage counseling. 4. Choose a therapist who can relate to your outlook on life. You are unique, and the therapist must be able to relate well to what makes you unique. This may be your education, your cultural background, or your life experiences. It is advisable to find a therapist who shares some sort of wavelength with you. If your ideas about life vary greatly from your therapist, then he or she may not be of great help to you. 5. Consider a therapist’s credentials and experience. A doctorate in psychology requires five years of education beyond a Bachelor’s degree and a one-year internship. Psychologists are required to follow strict ethical guidelines and to continue education throughout their career. It makes sense to check a psychologist’s education and experience before taking a decision to go to him or her. An untrained psychologist will be of no help to you. If you’re looking for a psychological counselor across Memphis, TN, reach out to Dr. Lee Horton, Ph.D. For more than twenty-five years, as a counseling psychologist, I have been helping individuals across Memphis, Germantown, Southaven, Lakeland, Olive Branch and neighboring areas with personal counseling, marriage counseling, and relationship counseling. I strive to provide my clients with a path to a happier life. For a complete list of my services, please click here. If you have any questions about psychological counseling, I’d love to hear from you. Please contact me here.